A big part of what I love doing is sharing it with others. While doing so with peers in collaboration, and under mentors and teachers in an educational setting, one of the most rewarding environments in which I worked was as a teacher. My classes have largely focused on introducing science and fabrication through the arts, both hands on, with digital means and through peer presentation. Learning our modeling software at LJCDS Summer STE[+A]M camp. Working with the 3D printer as a part of prototyping their designs. The industrial design course at La Jolla Country Day this summer is focused on acquiring the skills to use design software and prototyping techniques to create a variety of projects in two and three dimensions. Each student will be tasked with creating their own design firm, working both alone and in pairs to create a number of projects aimed at teaching them the software professionals use to design the world’s newest tools, products and architecture. The first projects will be aimed at the acquisition of design software geared towards two dimensional design. The students will work with the Adobe Creative Suite to understand the practices of graphic design, architectural blueprinting and product design. As “design firms” the students will create logos and cards, design their first blueprint, and work to understand beginning and advanced vector-based illustration and design. Next, the students will work with three-dimensional design software to plan a number of projects, both digitally and to be built and prototyped by hand. The projects are focused around using Google SketchUp, Autodesk 123D and Blender, 3D design software programs aimed at designing and prototyping industrial and consumer projects. The projects include designing a 3D printed lamp, modeling historic buildings in San Diego, and designing a lasercut sculptural desk organizer. Each project has its own challenges, having to work on creative aesthetics, firm design principals and material/medium awareness. Lastly, the course seeks to connect the intangible world of CAD and modeling to the tangible, creative world of making and sculpture. Several of the student’s projects will be actual physical models and designs, and many will require them to model and measure parts and components of the models, using drafting and measurement tools. The students will have 3D printed projects, lasercut projects and paper-based projects to take home and continue working with after the course. Slideshow of photos from class/camp. Breadboarding with the kids. We made Forrest Mims III’s Audible Light Meter, a simple photo-theremin. This course will introduce basic electronics and physics in order to facilitate the creation of a number of unique musical instruments and better understand the interaction between electronics, sound and our ears. Students will participate in the designing and building of their own ‘sound boxes’ while learning core basic principles of electrical engineering in an easy-to-understand way. At the end of the course, students will have designed and built several of their own funny, elegant or odd musical instruments utilizing electronic components, including an electronic sound box, and an amplifier they can use along with their new instruments. These electronic instruments and amplifiers will be designed as take-home pieces for the students to keep. Each day will be split in two parts, the first half of which will be spent learning and discussing the science, technology and art behind sound, music, electronics and instrument building and hands on experiments with acoustics and electronics. We will spend the second half of our day building our unique musical instruments from a variety of materials and technologies. This class is designed for artistic or techie students, as well as newcomers or students with experience in this topic. 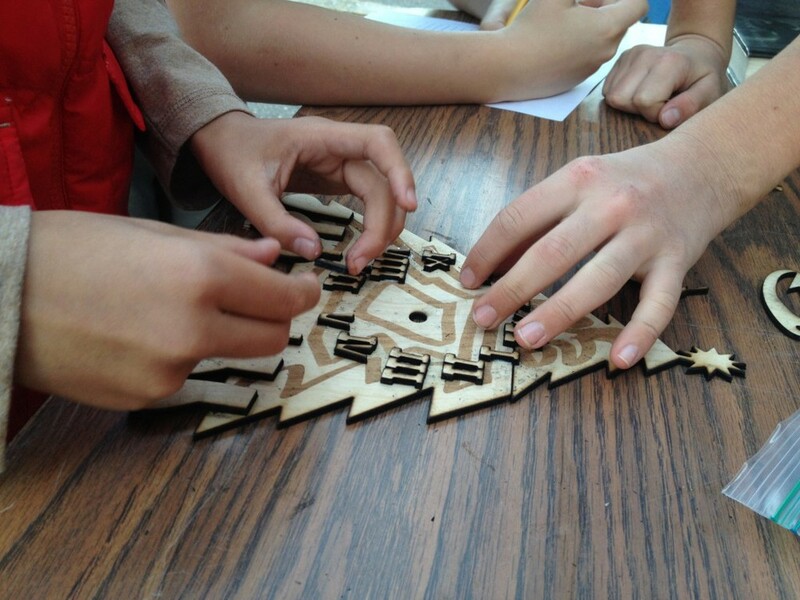 Students work on their lasercut clock project. In this after-school elective class at La Jolla Country Day was focused on teaching modern prototyping hardware and software. Focusing first on two dimensional design, the students worked with Adobe Illustrator and Inkscape to produce vector graphics capable of being cut on vinyl plotters and laser cutters. Next, the students moved to three dimensions, learning Tinkercad as a means of rendering both sculptural/creative projects and more technically minded models. The projects in this class revolved around two of our tools, the laser cutter and 3D printer. The 3D printer projects resulted in student creations ranging from minecraft characters to custom dice with answers to their questions instead of numbers. The laser cutting project was the creation of their own wall clocks, ranging from the Christmas themed clock above to a camera-shaped clock with the lens as the round clock face. The goals for this class were to understand the basic means of prototyping ideas with computer aided drawing programs, and realize those ideas using computer aided machinery. The majority of our software was open source and freely available, and the class teaches a bit about the advantage of the open source movement and modern computer systems.